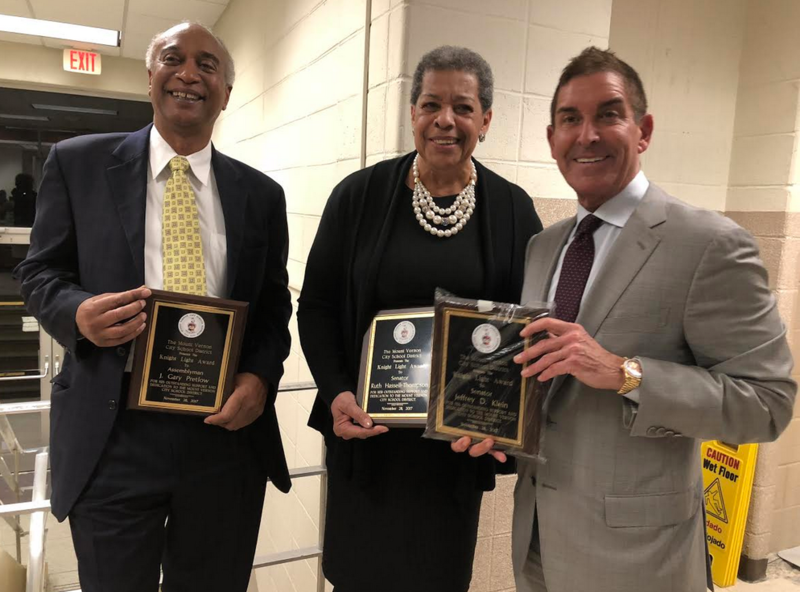 The Mount Vernon City School District awarded three invaluable community members with Knight Light Awards at a Board of Education meeting last night. The recipients included Senator Jeffrey D. Klein, former Senator Ruth Hassell-Thompson and Assemblyman J. Gary Pretlow. The Knight Light Award is presented to members of the Mount Vernon community that exemplify the qualities of a Mount Vernon Knight, including courage, justice, mercy generosity, faith, nobility, and hope. The award is intended to spotlight people or groups that have a positive impact on the District and its students. Each of this week’s recipients have contributed to the progress and well-being of Mount Vernon through a variety of projects. In May 2015, Senator Jeffrey D. Klein secured a state-funded grant to cover the costs of renovating the playground and baseball field at Pennington Elementary School. On Wednesday, Oct. 27, Mount Vernon students, parents and community members gathered at Pennington Elementary School for a ribbon-cutting ceremony, unveiling the new $94,000 playground. The recreational facility features two sections and is designed for Grades 1-3 and Grades 4-6 respectively. The new playground structure includes all new surfacing and play equipment and is suitable for up to 50 students at a time. The senator has also agreed to co-sponsor the Mount Vernon Classroom Heroes teacher recognition program. The district will host a gala for recognized teachers in March. Sen. Klein helped secure additional funding for renovations at Mandela High School and a greenhouse at Mount Vernon High School. Graham Elementary School unveiled a new, expansive park and play area in June 2017. This $2.5 million project was partially funded by a $1 million grant secured by former Senator Ruth Hassell-Thompson, helping to power the District’s 20/20 Vision. The park, which was built in a lot adjacent to Graham Elementary, includes a new soccer field, three playground equipment stations, two oval walking paths, raised garden beds, as well as new landscaping and a new parking lot. A marble park bench was dedicated in memory of Shamoya McKenzie, a Graham Elementary student who tragically passed away in January. Shamoya’s mother, Nadine McKenzie, Superintendent Dr. Kenneth R. Hamilton, Board of Education President Adriane Saunders, Mayor Richard Thomas, and Dr. Natasha Hunter-McGregor, Graham Elementary School Principal, were in attendance at the ribbon cutting ceremony and dedication last June. Hassell-Thompson also secured $400,000 in funding for Little Hands Children’s Center, a daycare in Mount Vernon. Much like Sen. Klein, Assemblyman J. Gary Pretlow helped secure state funding for recreational projects within the Mount Vernon City School District. In July 2015, Pretlow announced the allocation of $1 million to make necessary repairs to the Mount Vernon High School’s pool. The pool was affected by a leak in 2010 and due to budget cuts, the District was not able to afford repairs. The capitol secured by Pretlow allowed Mount Vernon to bring the pool into compliance with all applicable rules and regulations. The District also plans to provide free year-round swimming lessons to Mount Vernon residents and offer training programs for students interested in serving as lifeguards.